On September 24th, 2011 the 20th Edition of the fish Festival, will be held in Positano. Organized by the “volunteers for Positano”, the event could not be organized in a better period of time, the end of the Summer. Fornillo Beach will be the main location for the event, which will also move to other areas of the town. The Fish Festival, besides delighting your palates, it will also entertain people with musical performances and theatre performances. In fact, in addition to the rich stands presenting menus based on fish, crustaceans and mussels, wet from litres of wine, you can have fun listening to the wonderful folk music, or watching the show “an ancient history”, staged by the theater company of “Murattori”. Good food, good music and fun await you, therefore, Saturday, September 24th don’t miss out on the Fish Festival, a fantastic way to say goodbye to the summer! Pasquale Terracciano welcomes you to the event. 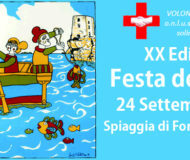 Description: On September 24th, 2011 the 20th Edition of the fish Festival, will be held in Positano. Fornillo Beach will be the main location for the event.